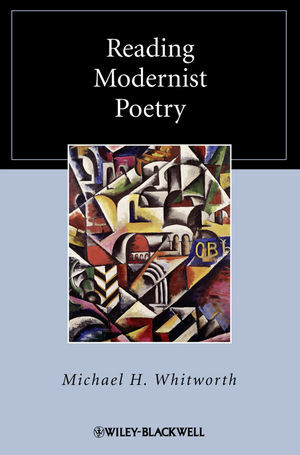 This essential guide to modernist poetry enables readers to make sense of a literary movement often regarded as difficult and intimidating. Michael H. Whitworth is University Lecturer in Twentieth-Century Literature, and a Tutorial Fellow of Merton College, Oxford. He is the author of Einstein?s Wake: Relativity, Metaphor, and Modernist Literature (2001) and Virginia Woolf (2005), and of other articles and chapters on modernist literature. He edited Modernism: A Guide to Criticism (2007), and he is an editor of the Review of English Studies. 3 Landscapes, Locations, and Texts. 5 Interpreting Obscurities, Negotiating Negatives. 6 The Sound of the Poem. 8 The Language of Modernist Poetry: Diction and Dialogue. 9 Literal and Metaphorical Language. 10 Mythology, Mythography, and Mythopoesis. Part III Form, Structure, and Evaluation. 13 Subjects and Objects in Modernist Lyric. 14 Temporality and Modernist Lyric. 16 Modernism, Epic, and the Long Poem.